Description: A Secular Regime Is Toppled By Western Intervention, But An Islamic Backlash Turns The Liberators Into Occupiers. Caught Between Interventionists At Home And Fundamentalists Abroad, A Prime Minister Flounders As His Ministers Betray Him, Alliances Fall Apart, And A Runaway General Makes Policy In The Field. As The Media Accuse Western Soldiers Of Barbarity And A Region Slides Into Chaos, The Armies Of God Clash On An Ancient River And An Accidental Empire Arises.This Is Not The Middle East Of The Early Twenty-First Century. It Is Africa In The Late Nineteenth Century, When The River Nile Became The Setting For An Extraordinary Collision Between Europeans, Arabs, And Africans. A Human And Religious Drama, The Conflict Defined The Modern Relationship Between The West And The Islamic World. 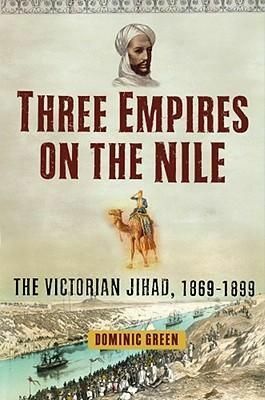 The Story Is Not Only Essential For Understanding The Modern Clash Of Civilizations But Is Also A Gripping, Epic, Tragic Adventure.Three Empires On The Nile Tells Of The Rise Of The First Modern Islamic State And Its Fateful Encounter With The British Empire Of Queen Victoria. Ever Since The Self-Proclaimed Islamic Messiah Known As The Mahdi Gathered An Army In The Sudan And Besieged And Captured Khartoum Under Its British Overlord Charles Gordon, The Dream Of A New Caliphate Has Haunted Modern Islamists. Today, Shiite Insurgents Call Themselves The Mahdi Army, And Sudan Remains One Of The Great Fault Lines Of Battle Between Muslims And Christians, Blacks And Arabs. The Nineteenth-Century Origins Of It All Were Even More Dramatic And Strange Than Today'S Headlines.In The Hands Of Dominic Green, The Story Of The Nile'S Three Empires Is An Epic In The Tradition Of Kipling, The Bard Of Empire, And Winston Churchill, Who Fought In The Final Destruction Of The Mahdi'S Army. It Is A Sweeping And Very Modern Tale Of God And Globalization, Slavers And Strategists, Missionaries And Messianists. A Pro-Western Regime Collapses From Its Own Corruption, A Jihad Threatens The Global Economy, A Liberation Movement Degenerates Into A Tyrannical Cult, Military Intervention Goes Wrong, And A Temporary Occupation Lasts For Decades. In The Rise And Fall Of Empires, We See A Parable For Our Own Times And A Reminder That, While American Military Involvement In The Islamic World Is The Beginning Of A New Era For America, It Is Only The Latest Chapter In An Older Story For The People Of The Region.